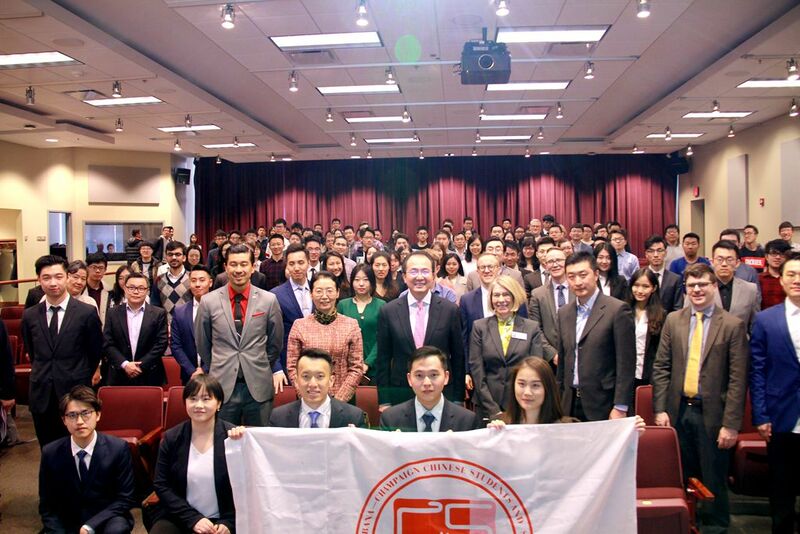 On April 7, 2018, Consul General Hong Lei attended the University of Chicago China Forum and delivered a closing speech at the invitation of the Chinese Students and Scholars Association. Ms. Chen Yinghui, Counselor of Educational Affairs of the Consulate, Mr. Balaji Srinivasan, Vice President of the University of Chicago, Professor Lars Hansen, Nobel Economics Prize Winner at University of Chicago, Mr. Charles Evans, President of the Federal Reserve Bank of Chicago, as well as 300 faculty and students at University of Chicago and people from all walks of life attended the forum. 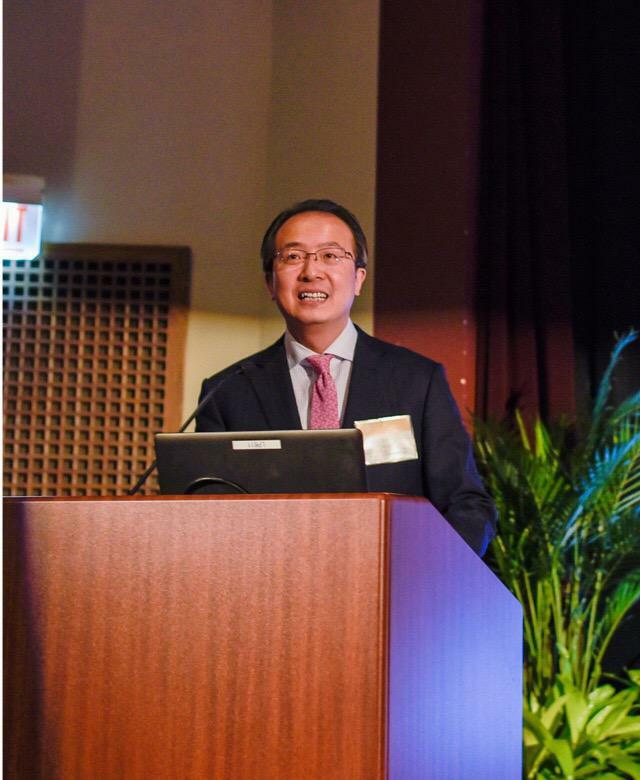 On the same day, Consul General Hong Lei also addressed the 2nd US-China Innovation and Development Forum hosted by the University of Illinois Urbana-Champaign (UIUC) Chinese Students and Scholars Association. Counselor Chen Yinghui, Ms. Diane Marlin, Mayor of City of Urbana, and 250 business leaders, faculty and students also attended the forum. In his speech, Consul General Hong Lei said that the 19th National Congress of the Communist Party of China declared that China’s development has entered a new era. China will completely build a moderately prosperous society by 2020. By 2035, China will basically achieve modernization. By the middle of this century, China will become a great modern socialist country that is strong, prosperous, democratic, culturally advanced, harmonious and beautiful. China’s development will not only enable the Chinese people to live a happier life, but also bring unprecedented development opportunities for the United States and countries around the world. 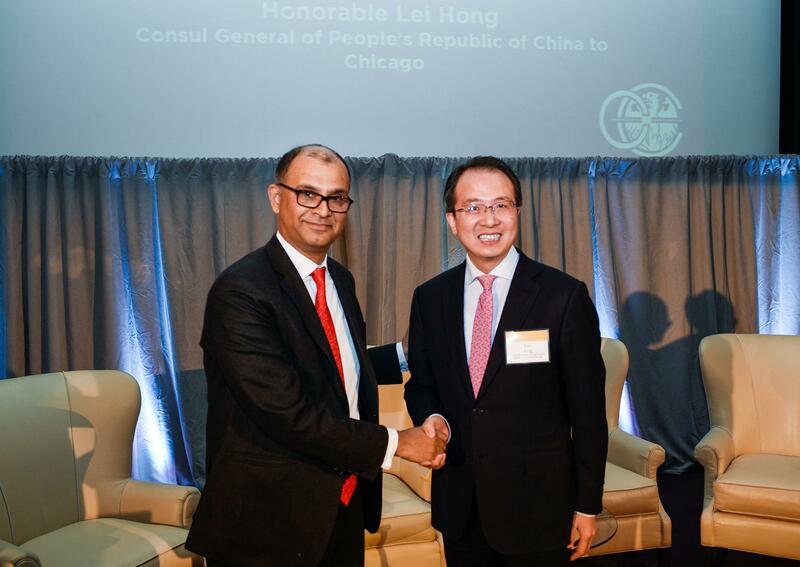 Consul General Hong Lei said that in the past 40 years, Sino-US relations have achieved tremendous development. The two countries enjoy ever closer economic and trade ties, as well as people-to-people exchanges. In 2017, the trade volume between the two countries reached 580 billion US dollars, making China and the United States the largest trading partners for each other. Two-way investment amounted to 230 billion US dollars. 5.6 million people traveled between the two countries, including 3 million tourists from China visiting the United States. There were also 360,000 Chinese students studying in the United States, accounting for approximately one-third of all international students in the United States. Among the nine states in the Midwest that the Consulate General of China in Chicago covers, four governors visited China last year. They all hope to seize China’s development opportunities, attract investment, expand exports and attract tourists and students, so as to boost the economic development and employment of their own states. It can be well said that China and the United States have huge common interests, which have become a strong impetus for the development of bilateral relations. Consul General Hong Lei stated that the US Government recently released a National Security Strategy which defines China as a rival, with which we cannot agree. Instead, China and the United States should be partners. China has always adhered to the path of peaceful development, and a strategy of openness and mutual benefits. China is committed to building a new type of international relations as well as a community of shared future for mankind. As the largest developing country in the world, China is focusing on improving the living standards of its own people and lifting the 30 million poverty-stricken population out of poverty. Even as China is becoming more developed, it does not seek hegemony nor expansion. We have no intention to challenge the international status of the United States. China is actively promoting the Belt and Road initiative as a new platform of international cooperation, and is committed to achieving common development with all countries around the world. In November 2018, China will hold the first International Import Expo in Shanghai, building a new platform for international businesses to explore the Chinese market. China will firmly defend the international order centered around the purposes and principles of the UN Charter. China does not seek to build an alternative international order. Consul General Hong Lei pointed out that recently, the US government announced high tariffs on Chinese exports to the United States based on the conclusion of the 301 investigation. This unilateral act of protectionism not only violates rules of the World Trade Organization, but also goes against US own commitment on trade, undermining the international free trade system. Once enacted, these tariffs will hurt China’s interests, and also undermine the interests of the United States. China resolutely opposes this protectionist approach by the United States. We have no intention of starting a trade war, but we are not afraid of fighting one. If a trade war is forced upon us, we will firmly defend China’s legitimate rights and interests. Consul General Hong Lei stated that China is a hotbed for innovation. China attaches great importance to the protection of intellectual property rights. It is now the world’s third-largest holder of patented inventions after the United States and Japan. These technological innovations are the fruits of hard work and wisdom of the Chinese people. China welcomes US companies to invest in China. There is not a single law in China that forces US companies to transfer their intellectual properties. The joint venture and cooperation between US businesses and their Chinese partners are based on terms agreed by the US side during bilateral negotiations with China regarding China’s accession to the WTO. Such arrangement also complies with the provisions of the WTO. Vice President Srinivasan said that the relationship between the United States and China is one of the most important bilateral relations in the world. The University of Chicago is willing to expand exchanges and cooperation with China, making active effort to advance bilateral friendship. 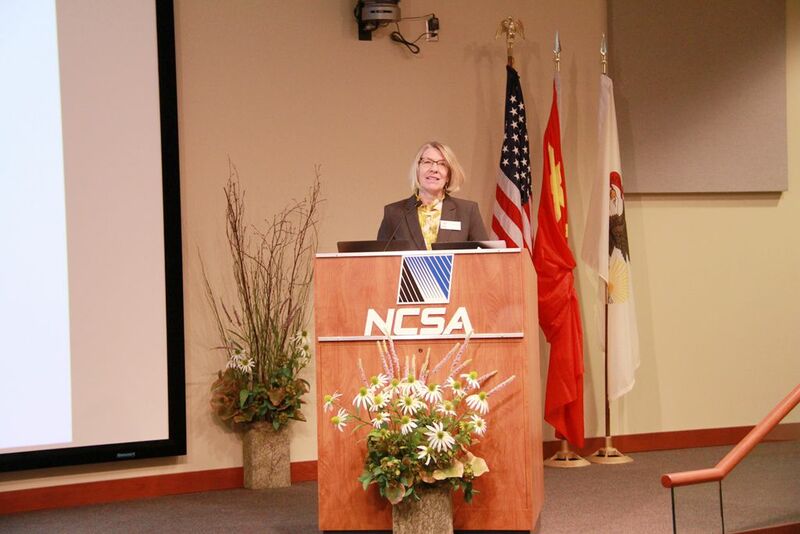 Mayor Marlin said that UIUC and China enjoy deep and long-lasting friendship. UIUC has produced renowned Chinese scholars and scientists including Zhu Kezhen and Hua Luogeng. I would like to thank the Chinese students for their contributions to promoting Sino-US social and people-to-people exchanges, as well as facilitating bilateral cooperation in innovation and entrepreneurship. At the University of Chicago China Forum which is themed as “US-China Dialogue in an Era of Transformation”, participants engaged in extensive discussions on Sino-US cooperation in the fields of economy, finance, technology, medical care, and private equity investment. At the UIUC US-China Innovation and Development Forum, representatives from the Chinese and US innovation and entrepreneurial communities exchanged their experience in innovation and starting up businesses.